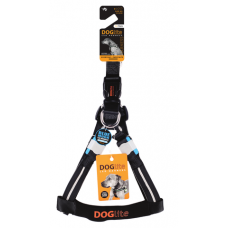 Dog Lite Double Trouble Dog Harness Blue Moon L75-90cm chest measurement25mm Webbing140kg Pulling CapacityDouble optic fibre stripAll DOGlite Harnesses now come standard with added Front Pull Option. The right harness adds comfort, support and assists in reducing 'pulling' when on leash. For those 'over committed' dogs, attach leash at front of chest to greatly reduce pulling. Mix and match with DOGlite's Dual Handle leash, and you have a great training combo - for young and old dogs.Some harnes..
Dog Lite Double Trouble Dog Harness Blue Moon M60-75cm chest measurement25mm Webbing140kg Pulling CapacityDouble optic fibre stripAll DOGlite Harnesses now come standard with added Front Pull Option. The right harness adds comfort, support and assists in reducing 'pulling' when on leash. For those 'over committed' dogs, attach leash at front of chest to greatly reduce pulling. Mix and match with DOGlite's Dual Handle leash, and you have a great training combo - for young and old dogs.Some harnes..
Dog Lite Double Trouble Dog Harness Blue Moon S45-60cm chest measurement25mm Webbing140kg Pulling CapacityDouble optic fibre stripAll DOGlite Harnesses now come standard with added Front Pull Option. The right harness adds comfort, support and assists in reducing 'pulling' when on leash. For those 'over committed' dogs, attach leash at front of chest to greatly reduce pulling. Mix and match with DOGlite's Dual Handle leash, and you have a great training combo - for young and old dogs.Some harnes..
Dog Lite Double Trouble Dog Harness Green Glow L75-90cm chest measurement25mm Webbing140kg Pulling CapacityDouble optic fibre stripAll DOGlite Harnesses now come standard with added Front Pull Option. The right harness adds comfort, support and assists in reducing 'pulling' when on leash. For those 'over committed' dogs, attach leash at front of chest to greatly reduce pulling. Mix and match with DOGlite's Dual Handle leash, and you have a great training combo - for young and old dogs.Some harne..
Dog Lite Double Trouble Dog Harness Green Glow M60-75cm chest measurement25mm Webbing140kg Pulling CapacityDouble optic fibre stripAll DOGlite Harnesses now come standard with added Front Pull Option. The right harness adds comfort, support and assists in reducing 'pulling' when on leash. For those 'over committed' dogs, attach leash at front of chest to greatly reduce pulling. Mix and match with DOGlite's Dual Handle leash, and you have a great training combo - for young and old dogs.Some harne..
Dog Lite Double Trouble Dog Harness Green Glow S45-60cm chest measurement25mm Webbing140kg Pulling CapacityDouble optic fibre stripAll DOGlite Harnesses now come standard with added Front Pull Option. The right harness adds comfort, support and assists in reducing 'pulling' when on leash. For those 'over committed' dogs, attach leash at front of chest to greatly reduce pulling. Mix and match with DOGlite's Dual Handle leash, and you have a great training combo - for young and old dogs.Some harne..
Dog Lite Double Trouble Dog Harness Northern Lite L75-90cm chest measurement25mm Webbing140kg Pulling CapacityDouble optic fibre stripAll DOGlite Harnesses now come standard with added Front Pull Option. The right harness adds comfort, support and assists in reducing 'pulling' when on leash. For those 'over committed' dogs, attach leash at front of chest to greatly reduce pulling. Mix and match with DOGlite's Dual Handle leash, and you have a great training combo - for young and old dogs.Some ha..
Dog Lite Double Trouble Dog Harness Northern Lite M60-75cm chest measurement25mm Webbing140kg Pulling CapacityDouble optic fibre stripAll DOGlite Harnesses now come standard with added Front Pull Option. The right harness adds comfort, support and assists in reducing 'pulling' when on leash. For those 'over committed' dogs, attach leash at front of chest to greatly reduce pulling. Mix and match with DOGlite's Dual Handle leash, and you have a great training combo - for young and old dogs.Some ha..
Dog Lite Double Trouble Dog Harness Northern Lite S45-60cm chest measurement25mm Webbing140kg Pulling CapacityDouble optic fibre stripAll DOGlite Harnesses now come standard with added Front Pull Option. The right harness adds comfort, support and assists in reducing 'pulling' when on leash. For those 'over committed' dogs, attach leash at front of chest to greatly reduce pulling. Mix and match with DOGlite's Dual Handle leash, and you have a great training combo - for young and old dogs.Some ha..
Dog Lite Double Trouble Dog Harness Orange Sunset L75-90cm chest measurement25mm Webbing140kg Pulling CapacityDouble optic fibre stripAll DOGlite Harnesses now come standard with added Front Pull Option. The right harness adds comfort, support and assists in reducing 'pulling' when on leash. For those 'over committed' dogs, attach leash at front of chest to greatly reduce pulling. Mix and match with DOGlite's Dual Handle leash, and you have a great training combo - for young and old dogs.Some ha..
Dog Lite Double Trouble Dog Harness Orange Sunset M60-75cm chest measurement25mm Webbing140kg Pulling CapacityDouble optic fibre stripAll DOGlite Harnesses now come standard with added Front Pull Option. The right harness adds comfort, support and assists in reducing 'pulling' when on leash. For those 'over committed' dogs, attach leash at front of chest to greatly reduce pulling. Mix and match with DOGlite's Dual Handle leash, and you have a great training combo - for young and old dogs.Some ha..
Dog Lite Double Trouble Dog Harness Orange Sunset S45-60cm chest measurement25mm Webbing140kg Pulling CapacityDouble optic fibre stripAll DOGlite Harnesses now come standard with added Front Pull Option. The right harness adds comfort, support and assists in reducing 'pulling' when on leash. For those 'over committed' dogs, attach leash at front of chest to greatly reduce pulling. Mix and match with DOGlite's Dual Handle leash, and you have a great training combo - for young and old dogs.Some ha..
Dog Lite Double Trouble Dog Harness Pink Sky L75-90cm chest measurement25mm Webbing140kg Pulling CapacityDouble optic fibre stripAll DOGlite Harnesses now come standard with added Front Pull Option. The right harness adds comfort, support and assists in reducing 'pulling' when on leash. For those 'over committed' dogs, attach leash at front of chest to greatly reduce pulling. Mix and match with DOGlite's Dual Handle leash, and you have a great training combo - for young and old dogs.Some harness..
Dog Lite Double Trouble Dog Harness Pink Sky M60-75cm chest measurement25mm Webbing140kg Pulling CapacityDouble optic fibre stripAll DOGlite Harnesses now come standard with added Front Pull Option. The right harness adds comfort, support and assists in reducing 'pulling' when on leash. For those 'over committed' dogs, attach leash at front of chest to greatly reduce pulling. Mix and match with DOGlite's Dual Handle leash, and you have a great training combo - for young and old dogs.Some harness..
Dog Lite Double Trouble Dog Harness Pink Sky S45-60cm chest measurement25mm Webbing140kg Pulling CapacityDouble optic fibre stripAll DOGlite Harnesses now come standard with added Front Pull Option. The right harness adds comfort, support and assists in reducing 'pulling' when on leash. For those 'over committed' dogs, attach leash at front of chest to greatly reduce pulling. Mix and match with DOGlite's Dual Handle leash, and you have a great training combo - for young and old dogs.Some harness..
Dog Lite Double Trouble Dog Harness Purple Haze L75-90cm chest measurement25mm Webbing140kg Pulling CapacityDouble optic fibre stripAll DOGlite Harnesses now come standard with added Front Pull Option. The right harness adds comfort, support and assists in reducing 'pulling' when on leash. For those 'over committed' dogs, attach leash at front of chest to greatly reduce pulling. Mix and match with DOGlite's Dual Handle leash, and you have a great training combo - for young and old dogs.Some harn..
Dog Lite Double Trouble Dog Harness Purple Haze M60-75cm chest measurement25mm Webbing140kg Pulling CapacityDouble optic fibre stripAll DOGlite Harnesses now come standard with added Front Pull Option. The right harness adds comfort, support and assists in reducing 'pulling' when on leash. For those 'over committed' dogs, attach leash at front of chest to greatly reduce pulling. Mix and match with DOGlite's Dual Handle leash, and you have a great training combo - for young and old dogs.Some harn..
Dog Lite Double Trouble Dog Harness Purple Haze S45-60cm chest measurement25mm Webbing140kg Pulling CapacityDouble optic fibre stripAll DOGlite Harnesses now come standard with added Front Pull Option. The right harness adds comfort, support and assists in reducing 'pulling' when on leash. For those 'over committed' dogs, attach leash at front of chest to greatly reduce pulling. Mix and match with DOGlite's Dual Handle leash, and you have a great training combo - for young and old dogs.Some harn..
Dog Lite Double Trouble Dog Harness Red Nite L75-90cm chest measurement25mm Webbing140kg Pulling CapacityDouble optic fibre stripAll DOGlite Harnesses now come standard with added Front Pull Option. The right harness adds comfort, support and assists in reducing 'pulling' when on leash. For those 'over committed' dogs, attach leash at front of chest to greatly reduce pulling. Mix and match with DOGlite's Dual Handle leash, and you have a great training combo - for young and old dogs.Some harness..
Dog Lite Double Trouble Dog Harness Red Nite M60-75cm chest measurement25mm Webbing140kg Pulling CapacityDouble optic fibre stripAll DOGlite Harnesses now come standard with added Front Pull Option. The right harness adds comfort, support and assists in reducing 'pulling' when on leash. For those 'over committed' dogs, attach leash at front of chest to greatly reduce pulling. Mix and match with DOGlite's Dual Handle leash, and you have a great training combo - for young and old dogs.Some harness..